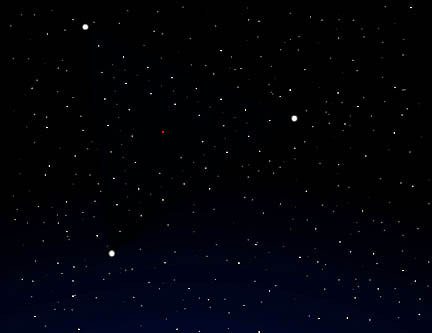 Frame from computer animation of huge, moving "triangle of stars" observed in February 2003, over the Grande Prairie region of northern Alberta, Canada. Image based on eyewitness drawings © 2003 by Adgraphics. January 18, 2004 Grande Prairie, Alberta, Canada - A little after 7 p.m. MT in February 2003, on a very clear night outside Grande Prairie, Alberta, Canada, two grade school friends were sledding in a back yard until they saw a big triangular piece of the starry sky move. Neither wants their names to be used in this report, but I was able to interview now-11-year-old, "Sally," who is still in grade school with an interest in art and music. Her neighbor is a year older.